to "Kennel van het Balgzand"
Carolien has attended the KK1 and KK2 course to be able to live and breed with our dogs at a responsabel way and to be able to give the right advices. Kaylo van het Balgzand BIS at British Bolognese Club Show 2017!! We are Caroline and Ruud Jongejans and already for a few years the very proud owners of a very special breed: the Bolognese. You can find our kennel in Holland, in the village Breezand, that’s in the northern part of North Holland. The title kennel doesn’t mean that our dogs actually live in a kennel, on the contrary, our dogs are companion dogs, and that’s why they are at their best in companion of people en other dogs, so they live among us. 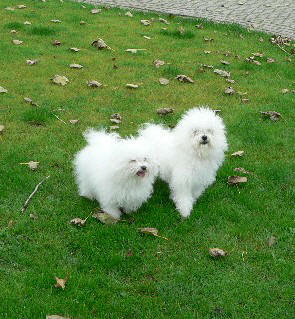 We only breed for hobby, but very seriously, to get healthy, breed typical and cheerful dogs. We guide our pups into their new homes and afterwards. We hope you are, ore will be just as enthusiastic about this breed as we are! With thanks to Tera and Wouter, for their Great Surprise: The making of this site, so that we can work it out ourselves. And of course for the many hours it cost them to explain it to us.